Last week, the Trump Organization, an umbrella group that oversees more than 500 companies which list Donald Trump, the United States President, as sole or principal owner, announced that it would use the federal E-Verify program to confirm the work eligibility status of its new employees. Because of a little-known provision in immigration law that I’ll explain later, the long overdue move may portend the first step in mandatory national E-Verify. In his statement to the Associated Press, Trump Organization Executive Vice President Eric Trump blamed the lax existing I-9 paperwork system for giving illegal immigrants the opportunity to submit false information on their applications which in turn gives employers cover when they hire unauthorized workers. Pilot programs were first introduced in 1996 to verify employee status, and Congress has since failed – for two decades – to pass mandatory E-Verify. Not only does the free, online program protect American and lawfully authorized workers from illegal job competition, it’s an effective tool against identity fraud. For Congress not to have passed this program is a disgrace. A new feature, Self-Lock, allows users to lock their Social Security numbers to prevent unauthorized or fraudulent use within E-Verify. At various times during the last several years, pro-immigration officials and leading daily newspapers have heartily endorsed E-Verify which has a high satisfaction rate with employers who use the program, and with likely voters. The short list of E-Verify fans: current Senate Minority Leader Chuck Schumer, then-Sen. Barack Obama, The New York Times, Houston Chronicle and Des Moines Register. E-Verify is more effective at protecting jobs and wages than a wall or other physical barriers. A 2017 Federal Reserve Bank of Dallas analysis showed that states which mandate E-Verify experienced wages that were 7 to 9 percent higher for U.S.-born or naturalized low-skilled, prime-age workers, while at the same time, the average hourly wages of unlawfully present Mexican men fell nearly 8 percent once E-Verify went into effect. Moreover, compared to physical barriers, E-Verify is an equal, if not superior, deterrent to illegal immigration. Faced with an exorbitant fee for a smuggler to guide him through the desert, a migrant who knows he’ll be E-Verified and therefore unable to get a job is much less likely to come to the U.S. Among the additional E-Verify benefits are a decrease in deportations and family separations, and the playing field for honest employers will become level. But despite public demand, law enforcement endorsement and a legion of positive data that proves E-Verify reduces illegal immigration, Congress has consistently bailed on mandatory legislation. In recent years, the House Judiciary Committee passed E-Verify bills, but then-speakers John Boehner and Paul Ryan refused to bring them to the floor for a full vote. As the 2020 presidential campaign heats up, President Trump has the option, should he decide to exercise it, to mandate E-Verify. Under 8 USC 1324a(d), the President, after advising Congress, has Executive Order authority to replace the existing and failing I-9 employment verification system with an improved, updated E-Verify version. An Executive Order requiring E-Verify would doubtlessly be temporarily enjoined, but President Trump could point to his bold decision as a good faith effort on his part to protect American workers. 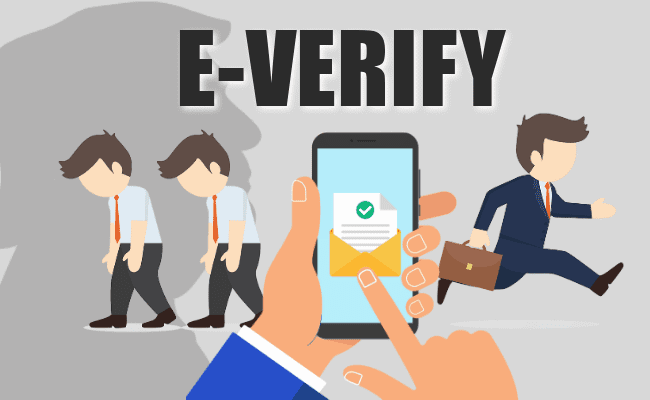 Let President Trump’s opponents explain to voters why they’re okay with maintaining the flawed, status quo I-9 verification that profits greedy employers and rewards illegal immigrants, but against E-Verify that protects American and lawfully present workers. S&P 500… The massive recovery has been fully driven by dovish central banks, despite unexciting earnings and guidance.